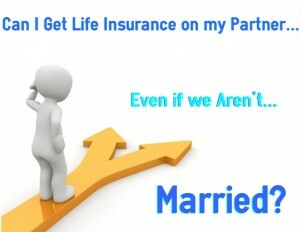 Can I Buy Life Insurance for my Significant other? AKA: Can I buy life insurance on my boyfriend or girlfriend? How would their heirs survive “financially” after he or she was gone? After all, if there wasn’t any insurance in place, is there a plan in place to make sure everyone would be taken care of? They have some type of pre-existing condition that may make it difficult to find coverage. Or they may simply do not “believe” in life insurance. But don’t fret, you can buy life insurance on someone else. You just need to follow some simple advice. The Real Question Behind — Can I buy life insurance for my significant other? We’ve found that most of the time when we’re asked, “Can I buy life insurance on my significant other?” the person is asking the question because their partner just won’t get life insurance on their own. Truth is people will make up a million different reasons to avoid buying life insurance but that doesn’t change the fact that one day, everyone including your significant other will die. How can I buy life insurance on my significant other? Let’s just assume that your partner is OK with you getting life insurance on him or her, but they’re just not going to go out of their way to make it easy. What if my significant other doesn’t want to pay the premium? This happens all the time, a family member or a significant other will often pay the premium for another loved one just so that they can be sure that the policy remains in effect. This is where working with TermLife2Go can make all the difference in the world because with dozens of different top rated best life insurance carriers and top no physical exam life insurance carriers to choose from, we’re sure to find one with a payment method that will work for even the most difficult of situations. And for those that are looking for burial insurance or final expense insurance, we also represent the best final expense companies. Don’t stop reading… Up and till now, we’ve avoided most of the insurance jargon gibberish, but there are two words we simply can’t ignore! In order for one to be able to take out an insurance policy on another, the one applying for the insurance must be able to demonstrate what is called “insurable interest”. Definition: Insurable interest exists when an insured person has a financial or other kind of benefit from the continuous existence of the insured person. So in order for you to be approved for life insurance on a significant other, you would need to be able to explain how you would be negatively affected financially by their death. Note: This is not limited to wages earned. If your significant other performs duties at home such as child care or other types of activities which would require having to pay some in the future to assume, an argument could be made that these activities satisfies an “insurable interest”. Ultimately, the need for the insurance needs to “make sense” to the insurance company and the underwriters reviewing your application. If you find yourself having a difficult time explaining why you would be effected financially by another person’s death, chances are you don’t have a true “insurable interest” in that person’s life and will most likely be denied coverage. Sounds like you have a lot of reasons to a least consider purchasing a life insurance policy on your significant other. We’ll have an agent reach out to you so that they can discuss what options you may have. I currently live with my fiancé who supports me financially while I’m finishing up my college degree. Unfortunately I know of someone who was in a similar situation to me whose partner died in a bad car accident and she was left homeless. I’m scared that could happen to me. My fiancé is in agreement about me taking out life insurance on him, I just don’t know what my next step would be.? We can certainly understand your concern and will have an agent reach out to you ASAP. I recently moved in with my boyfriend of nearly 5 years. I am disabled but currently being denied SSDI. He owns 7 homes outright and has a lucrative online business. He has one grown daughter. He says he loves me and he takes care of me and my 2 minor children but he does not want to get married. He wants to make sure his assets are protected and go to his daughter in the event of his untimely death. He has no life insurance and has made no provision for me in his will. We do not share anything. His bank account, his homes, even utilities are all in his name. Nothing ties us together. If he died tomorrow my children and I would be homeless and penniless his daughter getting everything. I get $600 a month in child support. I would like to get a life insurance policy on him for my own protection. He is 48 with a history of intermittent A-fib otherwise very healthy. I’m 53 with osteoporosis (broke my back in 3 places and have a 10 level fusion hence being disabled) but otherwise, I, too, am healthy. It sounds like you have all the need in the world for an insurance policy, what we will do is have an agent reach out to you via email so that we can learn a little bit more about you situation and give you some potential “quotes” for you to run by your boyfriend. Then if it looks like he is willing to have a policy put in place, we’ll be more than happy to help you out. I would like to get insurance on my Boyfriend who is separated but not legally but have been apart for over a year .they married in Florida she is in California but address I known. I am on disability early MEDICARE and have no immediate family. Just give us a call Monday morning and we’ll do our best to help you and your boyfriend find a policy that will ensure your protection. Insurance companies see family situations like this all the time which is why it shouldn’t be difficult for you to demonstrate that you both have an “insurable interest” in one another’s lives. What we would recommend that you do next is just give us a call so we can learn a little bit more about how much life insurance coverage you need and we’ll see what you can qualify for. My daughter’s boyfriend has cancer and claims she is the beneficiary to his life insurance, is this possible? We’d first like to say we’re sorry to hear about our daughter’s boyfriend’s condition, and that we hope that he makes a full recovery. Now with that behind us, to answer your question, yes it’s possible that your daughter may be the beneficiary to his policy. After all, he is free to choose whomever he would like as his beneficiary. Provided that you husband is willing to allow you to purchase coverage on his behalf, and he is eligible for the insurance that you’re interested in, you really shouldn’t have a problem getting it started. Why don’t you just give us a call at when you have a chance and we’ll run the numbers for you so that you can get a better idea about what the insurance may cost. Hi. My. Name. Is. LaTonya, and. I. Am. Currently. Dating. A. 71. Year. Old. Man. And he. Barely. Cares. For. His. Self. And. He’s. Sick. And he. Already. Took. Out. A. Will. And I. Currently. And. Have. Been. Taken. Care. Of. Him. Cleaning. His. House. Garage. And. Shed. And. His. Body shop. I. Cook. For. Him. I. Make sure. He. Showers. And. Wash. His. Clothes. I. Make. Sure. He. Takes. His. Medicine. I. Make. Sure he. Stays. Active. And. Excerises. He. Gets. His. Self. Worked. Up. Y. Getting. Angry. For. Nothing. I. Make sure. He. Eats. Right. I’m. Kinda. Like. His. Caregiver. I. Make. Sure. He. Goes. To. The. Doctor. And. I. Make. Sure. He. Pays. His. Bills. I. Payed. His. Bills. I. Make. Sure. He. Don’t. Spend. To. Much. Money. And. He. Cares. For. Me. But. I. Think. He’s. Already. On. His. Death. Bed. He. Has. High. Blood. Pressure. He. Has. Gluacoma. He. Has. Deppression. Acid. Reflux. Disease. He. Worries. To. Much. I. Care. For. Him. What. Can. I. Do. To. Help. Him. Pay. For. His. Burial. And. So I. Can. Afford. To. Care. For. My. Four. Small. Children. To. Etc…….. It sounds like a guaranteed issue life insurance policy would be your best bet for him. These types of policies would not require him to take a medical exam or answer any health questions, but he would have to be willing to allow the policy to be purchased on his behalf. Additionally, these types of policies would also have what is called a “Graded Death Benefit” which states that he would need to live for 2 years after the policy has been started prior to the policy covering natural causes of death. my adult daughter has cancer and her burial expenses would most likely fall on me. can I get life insurance on her without her knowing? I’m afraid to bring the subject up to her. We’re sorry to hear about your daughter’s condition and certainly wish her the best, unfortunately, all of the “guaranteed issue” life insurance companies that we work with would require the primary insured to sign the application. We’re pretty sure that this is “standard” within the insurance industry so we’re really not able to recommend much other than trying to “tactfully” bring up the subject. One option may be to visit the American Cancer Society which does have a lot of literature about things such as “what to do after treatment” and how to establish advance “care directives” which could lead to a natural discussion about a “worst case” scenario. I’m interested in getting life insurance for my fiance. Recently we had a relative who was supported by her fiance like I am, who died in a car accident and left her homeless. Which made me think it could happen to me. We’re sorry to hear about your loss, why don’t you give us a call so that we can learn more about how much life insurance you’re considering. Can I get insurance for my sister. Generally speaking, if your sister is aware and willing to allow you to purchase a life insurance policy “on” her, you should be able to. However, you many also need to demonstrate, to the insurance companies, that you have what is called an “insurable interest” in your sister’s life. “Insurable interest” refers to how you will suffer “Financially” in the event of your sisters passing. –	You’ll need to pay for her burial. –	You’ll be responsible for raising her children. –	She is currently supporting you financially. The best way to know for sure would be to give us a call and we’ll do the best we can to answer any questions you may have. I am 41 years old and my boyfriend is 61. I live with him and he totally supports me financially by paying mortgage, household bills, and my daily living. I work, but I only pay my car note and insurance and small bills. If he passed away, I would not have anywhere to go and would suffer without the help of him. He is healthy, but I would like to know if I can put a small policy of $50-75K just in case in 10-20 years he passes and we are not married. When it comes to getting life insurance on another person, the main concern that an insurance company will have is, do you have an “insurable interest” should the other person pass away. Clearly after what you have described, you DO HAVE AN INSURABLE INTEREST on your boyfriend. Which means that as long has he can qualify for life insurance (medically), you shouldn’t have a problem being approved as an owner of such a policy. Why don’t you give us a call so that we can go over some options that may be available to you guys. I am interested in getting life insurance on my boyfriend. We have lived together for 2 years and he travels for business at least 2 weeks a month. We live in a beautiful community and have a horse. I cannot work right now as I am on disability because I have cancer and just recently was diagnosed with epilepsy and I am unable to drive. If anything happened to my boyfriend not only would I be devastated but I would not have a place to live and being unable to drive and unable to support our horse is a huge fear of mine. Is there anything you can do to help me. Sounds like you have all the reasons in the world to look into getting some life insurance in place on your boyfriend. Just give us a call and we’ll see what he can qualify for. Previous Post: Life Insurance Approvals with Berger’s Disease or IGA Nephropathy. Next Post: Can I Buy Life Insurance on my Ex-Husband?